It’s the summer of 1985 and mechanic Steve Mahoney is dreaming big about owning his own shop. He’s getting there as slowly as possible, working one night shift at a time for a local towing company. One night, called to retrieve a car from the murky Red River, Mahoney finds the replacement body to his prized but damaged ’67 Camaro. There’s also a body inside the car, handcuffed to the steering wheel. Mahoney’s able to snap the Camaro up cheap at a salvage auction, but once he’s restored the car to its former glory, he discovers that its last driver is standard spectral equipment on his new ride, and she’s not leaving until she finds out who sent her to a watery grave. 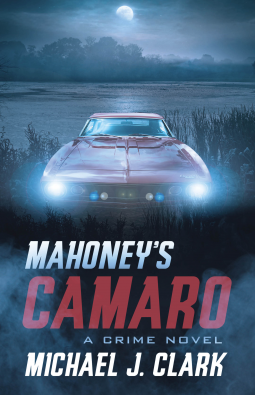 Mahoney’s Camaro is a gritty, fast-paced crime novel that will appeal to fans of Ron Corbett and Stuart MacBride. Combining expertise in the automotive world and a passion for storytelling, Michael J. Clark delivers an action-packed joyride that will grip you until the last page.